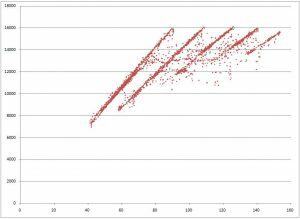 A useful way of displaying data that can make it easier to see certain aspects is by using an X-Y plot rather than plotting the data versus time or distance. That is, two channels are plotted against each other and time or distance does not factor at all. For example, we can plot apple and orange sales for a market versus time: 5 apples and 4 oranges in the first hour, 3 apples and 6 oranges the second and so on. But we can also plot the number of apples versus oranges in each sale. This would allow a quicker correlation of the ratios involved; we would easily see if people were buying twice as many apples as oranges, for instance. 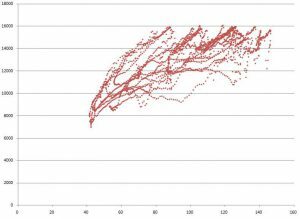 The same lap, with wheel speed and rpm shown as an X-Y plot. Each gear is represented by a line, and shows the maximum and minimum rpm used. The scattered points not falling on the lines represent downshifts. Likewise, many software packages allow two channels to be plotted in this format. 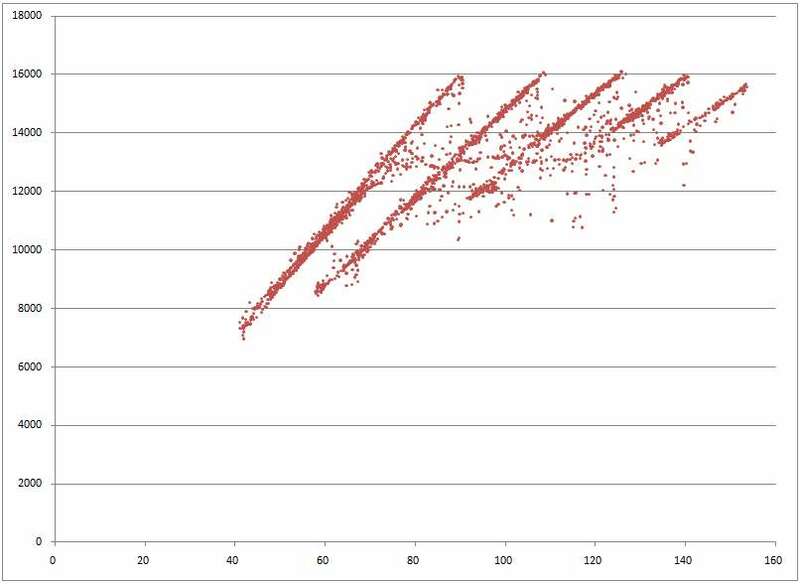 One X-Y plot that is particularly useful is road speed and engine rpm. This graph generates an individual line for each gear that represents the rpm band utilized for each gear. This allows a quick evaluation of the peak rpm used in top gear to help with final gearing selection. But it also shows the peak rpm for each gear, which can help with selecting internal gear ratios if your motorcycle is so equipped. If your software does not generate X-Y graphs, you can use the “export data” feature to convert the two required channels to text or Excel format. Open the file in Excel and create the graph by selecting the two columns of data and choosing the scatter graph option. 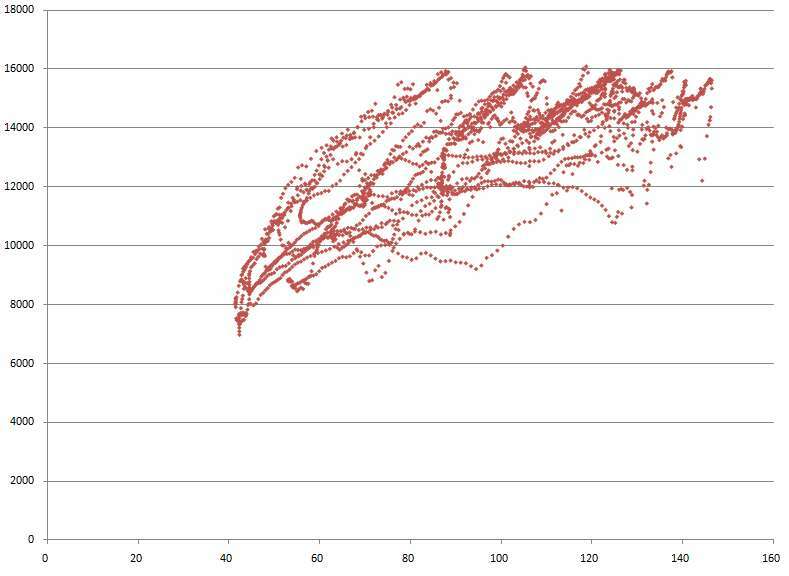 This plot uses GPS speed rather than rear wheel speed. Because of the change in tire circumference when the bike leans over, GPS speed is not proportional to rpm, and the plot is much more scattered. This particular plot works best using wheel speed rather than GPS speed, as wheel speed and rpm are directly related through the gearbox. GPS speed, while accurate for speed, is not always proportional to engine rpm for reasons discussed earlier (Difference between wheel speed and GPS speed). This makes the X-Y plot much less clear and the analysis is more difficult.